Sometimes I think I live in paradise. Well, paradise if you omit the 405 freeway, the congestion, smog, the high cost of living and state income tax. Even though Southern California gets a bad rap (and sometimes deservedly so), it’s still filled with great beauty and nature and it’s easy to see why it’s called the Golden State. For example, on a clear day I can see the ocean to my left and snow covered mountains on my right. In one single day I can swim at the beach in the morning, sweat in the middle of a desert during lunch and throw snowballs in the afternoon and still be home in time for dinner. It’s geographically miraculous and an ever constant source of personal amazement. Few places in the world have our climate, and this explains why California is an agricultural goldmine. Plenty of sunshine, cool days, mild winters and an ample amount of heat make for luscious environs, and I only need to set foot into my backyard to experience paradise. While my deepest gratitude goes out to Mother Nature and all that she supplies us I cannot forget another woman who has made my life so extremely special; her name is Pat. You see, Pat is my partner’s grandmother and the original owner of the home we live in. Pat was a homemaker and an avid gardener. She was also a lover of all things tropical and traveled to Hawaii, Fiji, the Philippines, Tonga, Tahiti, Bahamas, Virgin Islands and every place in between. She spent countless hours planting, culling, trimming and beautifying her yard, planting the small cuttings that she brought home from all her travels. I bet she had no idea that 60 years later her grandson’s partner would whisper a little “thank you” each time the season’s first plumeria or peach or nectarine appeared. To stand in her yard and literally reap the fruits of her labor is such a gift, and it reminds me that if you nurture and love and tend to and care for life’s treasures you will be rewarded in ways greater than you can ever imagine. Sometime around 1955 Pat (or Granny as we called her) planted a row of plumeria trees, fruit trees, palms, staghorn ferns and numerous hibiscus trees in her backyard. Decades later they’re still thriving and every year I love collecting the plumeria flowers for fragrant homemade leis. I hate to see those beautiful flowers go to waste! 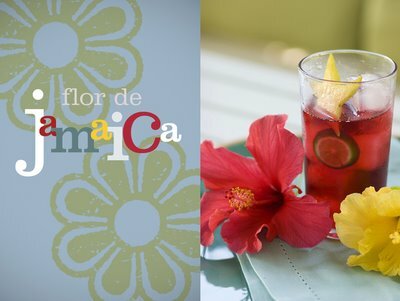 I also discovered how easy it is to make the drink Jamaica from all the hibiscus flowers. Dried flowers from the Hibiscus sabdariffa are steeped in boiling water and allowed release their color and flavor (the bright red color is due to the presence of anthocyans, the same compounds that give beets their color.) The soaked flowers are given one last squeeze before discarding them and the liquid is strained, sugared and usually served over ice. Jamaica is high in vitamin C and has a tart, almost cranberry-like flavor and can deliver quite a pucker. If you can’t find fresh hibiscus flowers (talk about eating locally!) you can usually find the dried variety in health food stores or Latin markets. If you find yourself in Southern California during August consider this an open invitation to join us in our small spot of heaven while wearing a homemade lei and sipping Jamaica. Paradise is always much better shared. I’m not big on formalities but if you’re saying Ja-may-kuh like the Island then you’re just a tad bit off. Say it with me: huh-mai-kuh. There. Much better. Oh, and if you’re female and time traveling from ancient Egypt, you might want to stick with water. Red hibiscus flowers were believed to induce lust to the highest degree and therefore a forbidden drink. More for me! In a saucepan bring the 1 1/2 cups of water and blossoms to a boil. Continue boiling for 2 to 3 minutes. Remove from heat and add remaining water and sugar. Transfer the liquid to a pitcher and set aside overnight. Of course you can serve immediately over ice but the flavors will be better developed if you wait. Garnish with lime wedges. You're right.. a true sip of paradise indeed! Props to your Grammy! One minor thing -- anthocyanins. You dropped a sylble. Bravo, Matt! Keep the writing coming! ah! herbs... you're speaking my language, matt. jamaica sounds infinitely more romantic (especially when pronounced correctly! thanks for that - i was definitely mispronouncing it.) than "hibiscus flower infusion", or to shorten that mouthful, "hibiscus tea", as i've always called it. whenever there are fresh hibiscus flowers to be found, i can be found in my kitchen over a pot of boiling water, a mass of red petals in my hand, dropping them one by one into the rolling brew. during the winter when there are no live fresh hibiscus flowers to be seen, i have to settle for dried; fortunately i have a very large jar full of crushed hibiscus petals in my apothecary. i usually reserve this particular jar's contents for just such a craving. this is also very good for staving off a common cold - i toss in a handful of rosehips with the boiling water for vitamin c and a couple of slices of astralagus root, sweeten the brew with honey and bolster with the juice of a whole lemon (of course, meyers if i've got them!) as a natural sinefrin: consumed hot, it works every time! mine never ever ever looks quite as gorgeous as yours does, though... i gotta start slicing a starfruit in mine. I´m so longing to try that. Last year around this time 101 cookbooks blogged about this, and I hunted all over for hibiscus flowers. No luck, not even in the latin markets. I´ll try again this year. Matt, Just recently found your site and I love it. Especially love the entry about the snails, fascinating! I had always heard that our garden variety is similar to ze french one. You live to tell. I've been drinking this stuff since I was a kid and I never knew jamaica came from hibiscus flowers. Damn. I got to start asking some questions. We are wellocme to it's configuration.